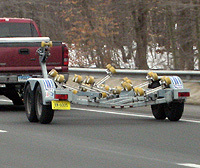 These plates are used by boat trailer dealers. This type started in the mid 1990s, around 1994 or 1995. These plates are issued in the New Car Dealer format and started with dealer number 6000. The first plates of this type were reflective white on blue and revalidated with decals, similar to other dealer license plates at the time. In 2003 the plates were maroon on reflective silver, again similar to other dealer plates, but were revalidated with decals through 2005. Eventually embossed dates came into use along with the distinctive reflective yellow background. For 2009 and 2013 expirations the numbers were blue.